Despite the perception that pressure sores, also known as bedsores, shouldn’t be a common problem in urban areas, pressure sore lawsuit filings in large, modern cities– such as Chicago— are more common than you may think. Do not allow yourself to be misled if a facility or caregiver insists that the development of pressure sores is just an inevitable fact of life and growing old. The truth of the matter is that pressure sores develop very slowly over time and the presence of stage four pressure sores is usually the result of inattentive caregivers over a long-term period. To understand the severity of neglect that is required in order to allow an elderly patient to develop stage four pressure sores, we need to understand how pressure sores develop and how they can be prevented or treated in their early stages. When a patient is confined to a wheelchair or hospital bed, continued pressure to the joints and areas of the body that have continued contact with the hard surface create pressure that limits the circulation to the affected area. Because the blood is cut off to the area, the cells are deprived of much needed oxygen and begin to slowly die off. This process takes time to occur and is typically exhibited in four different stages. Stage One— The onset of a pressure sore is very mild and the patient may complain that the area itches or hurts. The affected area will be visibly red and may feel firm when it is touched. Stage one pressure sores are easily treated by removing the pressure on the surrounding area and allowing the area to heal itself naturally. Stage Two— Stage Two pressure sores mostly resemble blisters and may have a red or purple discoloration. At this point, the skin has begun to die and peel away due to the lack of oxygen to the surrounding cells. Stage Two pressure sores are considered open wounds and therefore present a risk of infection if left untreated. Like Stage One pressure sores, however, Stage Two pressure sores are easy to treat when they are caught and the recovery is fairly quick. Stage Three— When a pressure sore has been allowed to progress to Stage Three, the tissue loss has accelerated and ligaments and tendons are now beginning to deteriorate. 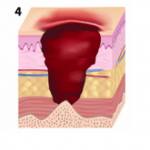 The appearance of a Stage Three pressure sore is that of a deep and open wound. Due to how noticeable a pressure sore is even at Stage One, it is highly improbable that a Stage Four pressure sore would form as the result of the normal aging process— as some facilities will try to have you believe. The prevention and treatment of bedsores requires very little more than moving the patient in order to relieve the pressure and simple first aid and care. Therefore, if your loved one has developed a Stage Three or Stage Four pressure sore, it is more than likely that neglect is responsible for the sore being allowed to progress to that stage. Even in so called ‘big cities’ like Chicago, pressure sore lawsuit cases are more common than most people expect from well-regarded medical facilities in an urban area. The majority of neglect in nursing home facilities is the result of those facilities being understaffed or improper training of the personnel tasked with giving care to patients. By simply making sure a patient has not been allowed to remain in the same position for more than two hours, the majority of pressure sore cases are prevented or treated quickly before they can progress. If your loved one has been diagnosed with a Stage Three or Stage Four pressure sore in a Chicago medical facility you likely have legal rights to recover damages for the accompanying pain, disability and medical expenses. An attorney who has experience prosecuting nursing home negligence and medical malpractice cases can assess you case and advise you of your legal options.